Hello Friends! 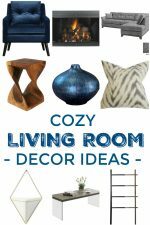 Today I’m dishing about Living Room Design Ideas, my Design Dash room reveal and where to get the look! All the furniture and decor sources are linked up at the end of the post! 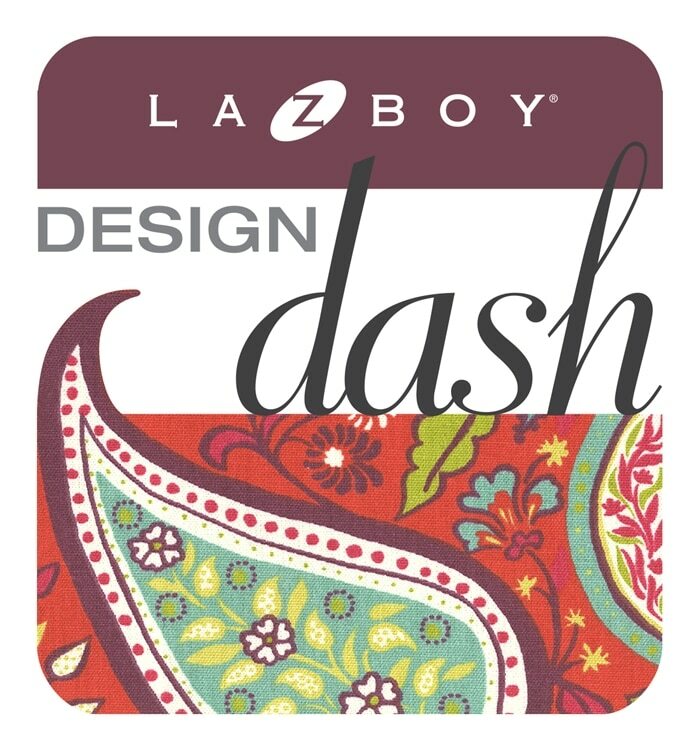 I can’t wait to fill you in on the details of my amazing experience with the La-Z-Boy Design Dash Challenge and my room design! It all started with a sofa….not just any sofa. A sofa I personally designed at my local La-Z-Boy showroom with my choices for color, fabric, contrast piping, accent trims and wood finish for the legs. Thank you to the talented La-Z-Boy designer, Zeina, for her help in informing me of all the beautiful options that I could give my Talbot sofa. This is my La-Z-Boy sofa design: A gorgeous cream, neutral beauty with coffee colored legs, silver nail head trim and…. wait for it!! !….beautiful piping! It’s 5000% gorgeousness! Read this article on how to Understand The Color Wheel & Color Schemes To Become A Better Decorator. This will help you pick the perfect color for your sofa and room colors. The design dash started with an empty room and my sofa. The challenge was to shop/dash for my living room furniture and decor in just 1 hour (!) at the two story La-Z-Boy showroom in North Carolina. Plus I had to complete the design in just 7 hours!! Including figuring out a room layout, placing the furniture in the room, decorating with the accents and wall art! The whole Design Dash was completed in just 36 hours! Oh yes, and this was the other part of the challenge – I didn’t get to see my room in advance of the one hour showroom dash! 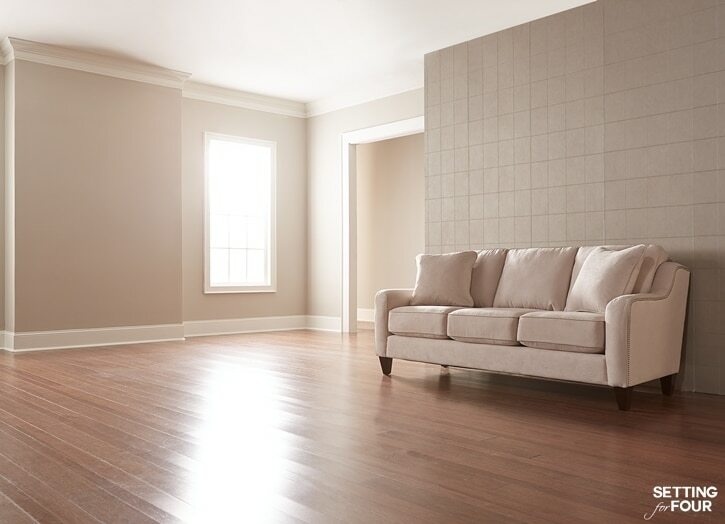 Read this article on How to Pick Paint Colors With Confidence! to help you pick paint colors for your home. 7 bloggers, 5 rooms, one fun La-Z-Boy Challenge! I just love my room! It was the most FUN I have had in a long, long, long time! Challenging? Yes! Rewarding? You BET! 7 tips on how to design and decorate a living room! 1. Start with a ‘Hero’ inspiration piece of furniture and a focal point for the room. 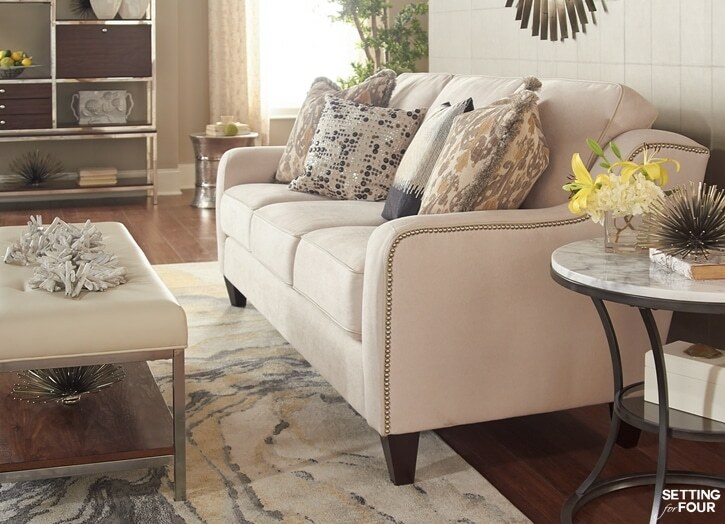 My room design began with this gorgeous neutral colored Talbot Sofa – it’s my ‘Hero’ inspiration piece of furniture that creates a statement and WOW factor. I absolutely love the shape, size and lines of it! It’s a 3 seat cushion, 3 back cushion sofa with beautiful scoop arms. It’s so comfortable! I chose a creamy chalk color Performance Fabric in ‘Hemp’, contrasting leather piping in the same color to add texture and subtle elegant detail, silver nail head trim (you know I love my metallics and bling!) and coffee colored wood legs. It’s so chic and beautiful! My focal point for the room is a gorgeous over sized metallic gold mirror. This mirror makes a big statement! It’s the first piece I selected in the showroom and it’s what I designed the room around. 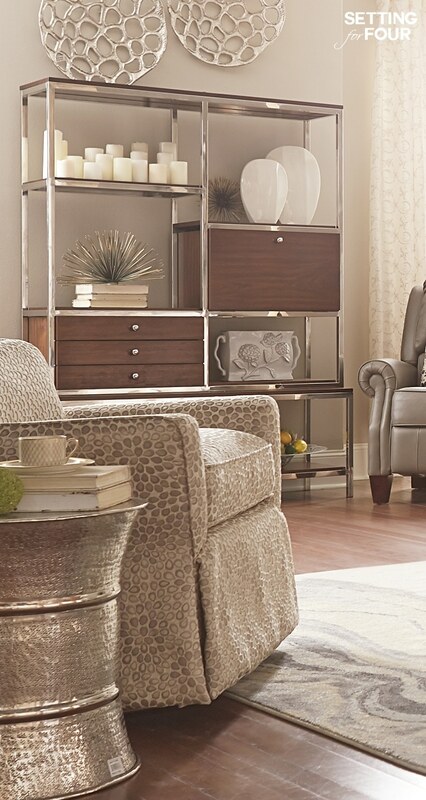 It’s glam style, soft metallic finish and clean lines guided all of my other furniture and decor choices. It’s what gave my room a feel and style…I call it Livable Luxe. I designed my room around a feeling of easy, livable, comfortable glamour and elegance. A place to enjoy with your family and a place to entertain. Love this Bench coffee table! So comfy to put your feet up on and lots of space to add decor and books! Every room needs balance. Balance in height, finishes and color. To balance the low sofa I added a tall Storage Wall Unit. It’s chrome and wood finish is so dreamy. It offers lots of storage space and lots of space to decorate! It truly is stunning! I added even more height by hanging these 3 silver bowls above it. They were displayed in the showroom as bowls for a table but I decided to hang them for architectural interest. They remind me of honeycombs! The silver finish on the bowls balances the chrome finish on the shelving unit. I love neutrals and styled the shelving unit with more creams (candles), whites (vases) and metallics (Gold Metal Sea Urchin accents). I also added lots of stacks of books – another decorating trick to elevate a single decor item and give it presence. I added a silver bar cart to the back hallway – you can see it peeking out. I added this gorgeous Owl Art over it for balance. Next I added two fabulous dove-grey leather chairs. These babies recline too! Style plus comfort all the way in my room! These chairs also have nail head trim detail. It’s all about the details! I arranged the chairs so that they flanked the bookcase to create a separate zone in the room. 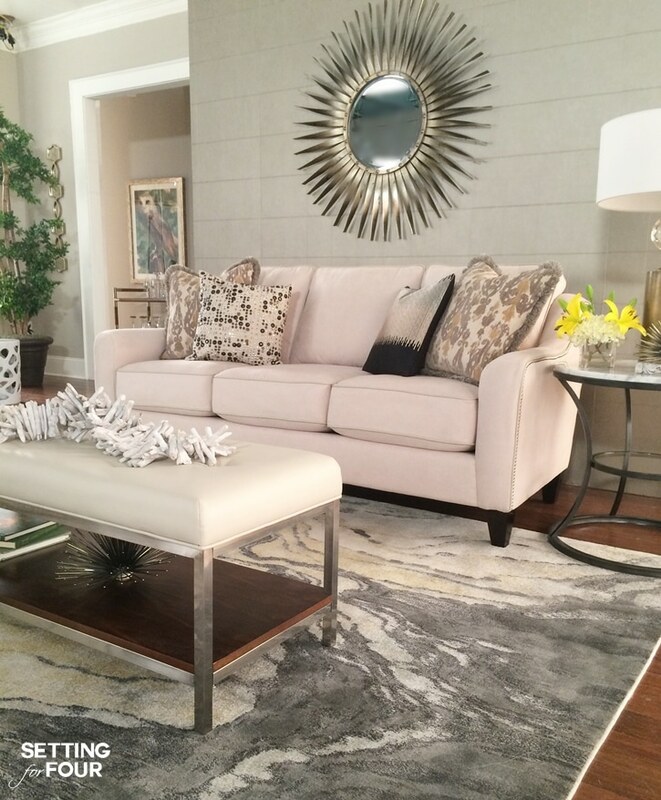 This gorgeous gray, ivory and yellow area rug has a beautiful marble-like pattern – I placed it under the sofa so that the front legs were on the rug. The graphic beaded pillows add pattern and a pop of contrast. Next up layer in texture. I love adding LOTS of texture to my rooms. 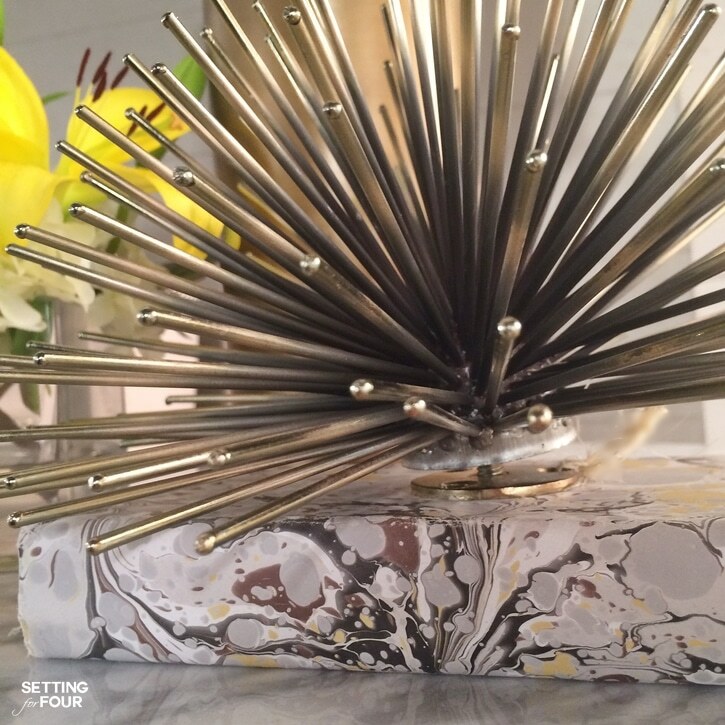 I chose this metallic side table for a hit of texture – so beautiful! A white garden stool in an openwork design adds more texture by the chairs and a place to put a drink and book. The leather chairs, the beaded pillows and the metallic sea urchin decor all add texture too. Taking cue from the grey, white and soft yellow area rug I chose yellow as my accent color. When choosing an accent color repeat it throughout your room to make it intentional and create ‘flow’. 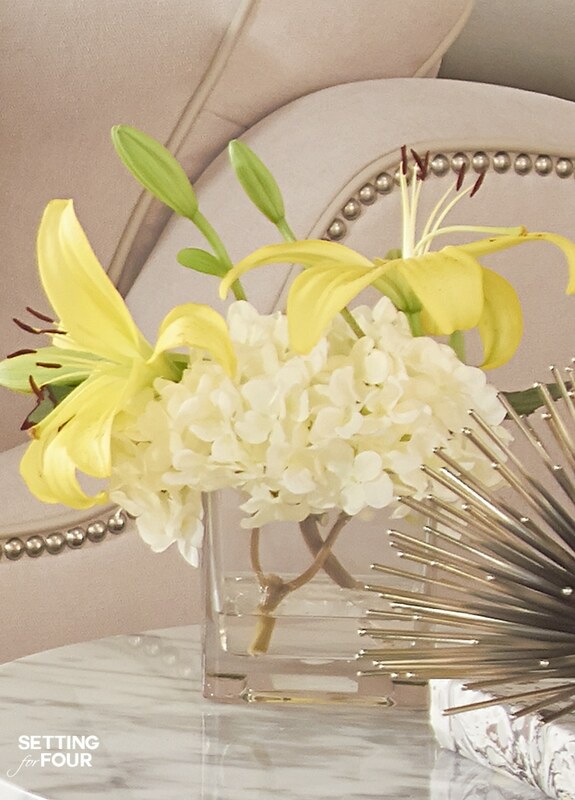 I added yellow lemons in a bowl, yellow lilies in a vase, and pillows with a touch of yellow too. Adding these two tall potted trees gave height and interest to my room. I believe that every room needs some greenery to give it life and personality. I repeated the green in the room by adding green mossy spheres in bowls and the Owl Art has some green in it too. I hope you love the room I designed as much as I do and enjoyed my Living Room Design Ideas: 7 tips on how to design your own living room from start to finish! Check out La-Z-Boy for stylish, comfortable home furniture and more design inspiration! Update: This giveaway is now over- thank you to everyone who entered! 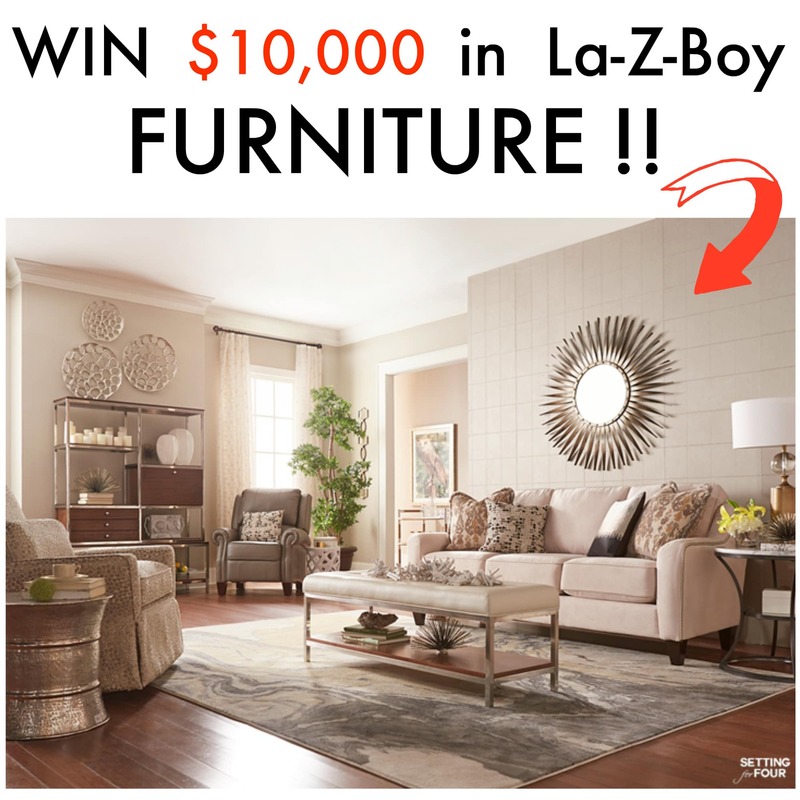 Every vote counts as an entry for a chance to win $10,000 in La-Z-Boy furniture – what an amazing prize! And you can vote once per day until December 20th, 2015 when voting ends. 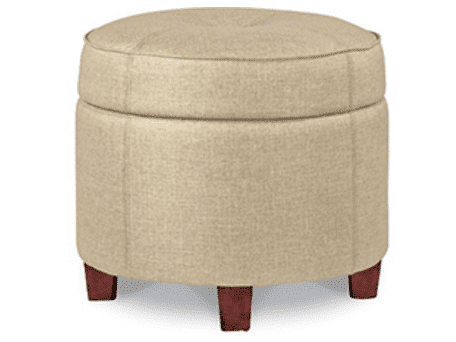 ….to add to the fun, my friends at La-Z-Boy are also allowing me to give away this La-Z-Boy ottoman to one Setting for Four reader! Whoo-hooo! Enter the rafflecopter below – Open to USA and Canada – Good Luck! Disclaimer: This post is in partnership with La-Z-Boy. All opinions are completely my own. See all my home furniture and decor! I really like the Talbot Sofa. I love your room Heather! …and Kelly is right…it’s glam! I think my favorite thing in your room is that sunburst…love it. 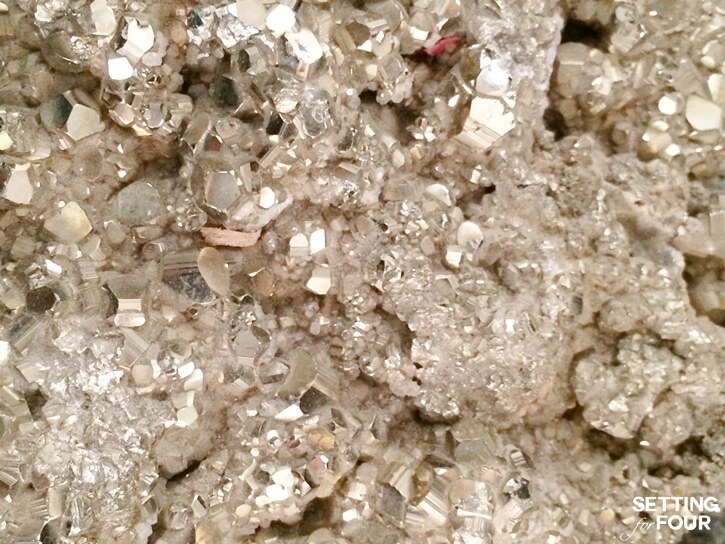 Wow, you have so many great textures and patterns in your room…beautiful! I love the chair with the lovely floral pattern. I’m so thrilled to hear that you love the textures and patterns I used too Amy!! 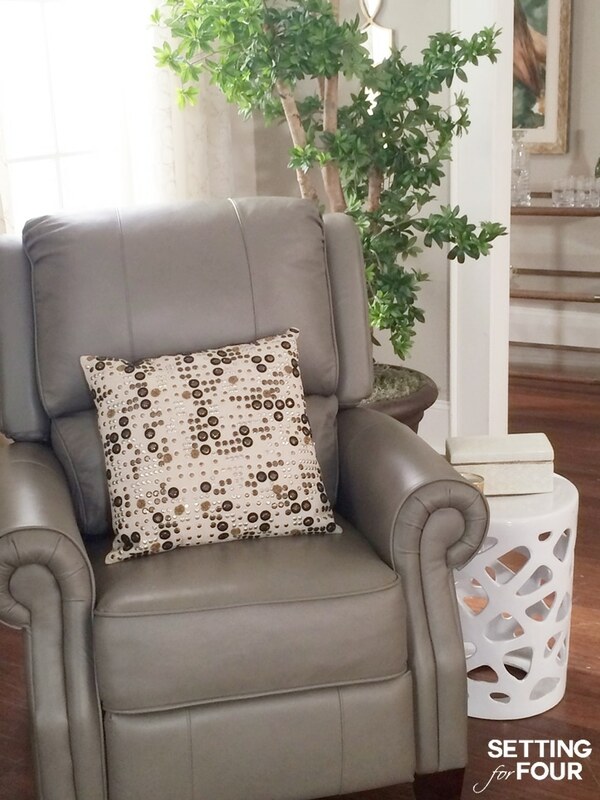 That La-Z-Boy chair is a swivel rocker too – soooo comfy! There are two things I love in your room, the oversized mirror and the metallic trio of circles, gorgeous!!! I really like the way the room came to life with the selection of furniture. If my girlfriend sees this I’ll be needing to make some additions to my home !! LOL – that’s funny Mick and thank you for saying that you like my room! Thanks so much for visiting! I can’t pick just one item, it’s the whole room—-just perfection! I wouldn’t change a thing. Everything in the room is beautiful, from the color on the walls to the rug on the floor! I love all the silvery pieces, the bowls on the wall, the entertainment center, the big starburst mirror, round hammered side table, and that wonderful padded bench/coffee table-perfection! Your sofa, recliners, and lovely textured chair(I bet it swivels/rocks, right?) looks serene and elegant, ready for family and friends. Yes Dee you are right – that chair swivels and rocks!! Thank you for your sweet words…I so appreciate them! While I can appreciate the talent and style of all the featured rooms, I fell in love with your room design. The color and textures are truly amazing. The accessories you selected compliment the furniture perfectly. While I typically am not a fan of the use of yellow it adds so much to the room, and will definitely have me rethinking using yellow in the future. 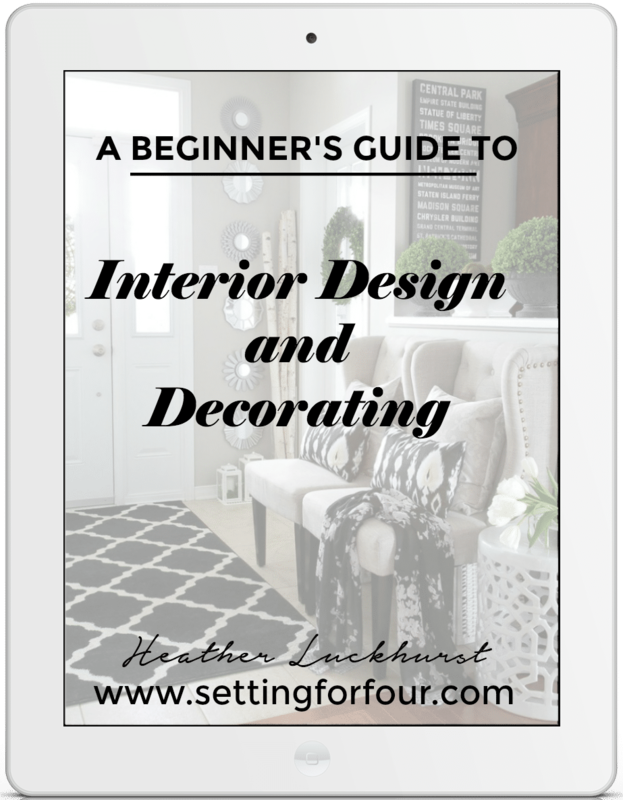 Thank you for including the seven tips for designing a living room with your room reveal, what a bonus for your readers. 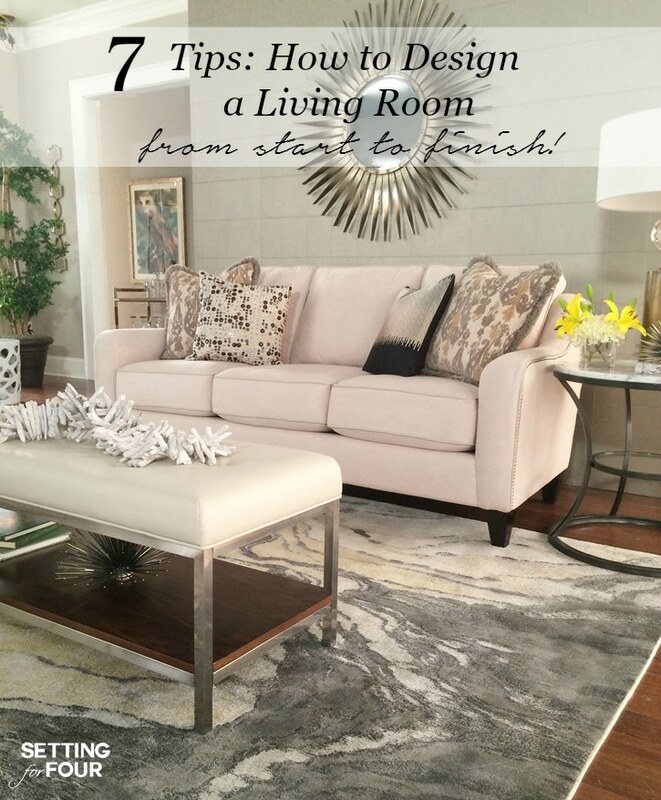 I’m so thrilled you enjoyed my seven tips for designing a living room Kathleen! I’m so excited to hear you are rethinking yellow! Thanks so much for visiting! 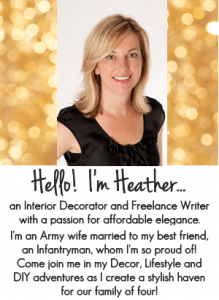 What a beautiful room, Heather. Love it and it sure looked like a ton of fun to do. Thanks Lisa – the Design Dash SO MUCH FUN!! I’m so glad you like my room – thank you for your compliments!! Me too – seriously love it! Thanks Susan! Love this room it’s really beautiful and definitely gives a luxe vibe! 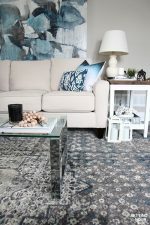 I think my favorite piece is the rug, I love that marbled look. The marbled pattern makes my heart pitter patter too Erin! Thanks for your lovely comments and for visiting! I love the whole room. I really like the sofa that you have chosen. It is so versatile that you can change colors scheme at any time and it will fit. You can go any direction with this sofa. Good choice! You’re so right Linda – it is super versatile! I love choosing neutral furniture so that accent colors can be switched up! Thanks for your compliments! Absolutely gorgeous! Love you room design with all of its gorgeous, luxurious textures and details. My favorite is the talbot sofa! The Talbot has such a beautiful shape – thanks for visiting and your lovely compliments Nicole! What a gorgeous space! Absolutely stunning Heather! Thank you Ursula – I’m so glad you like my room! I love the choice of color for the sofa! You can choose accent colors often. I voted for your style! I like that the La-Z- Boy chair is swivel. I love the swivel feature of this La-Z-Boy chair too! It’s so comfy – a great reading chair or chair to watch TV in! I love, love ,love the sofa you created. That’s my favorite! I love the storage unit you added to one side of the room. It really adds to the overall look of the room. I also fell in love with the dove grey armchair! It looks so comfy, and add a different dimension to your space. Thanks Lian!! I so appreciate your lovely comments on my room! I love the room, it’s so light and fresh looking! You are so sweet Jennifer! I love my rooms to be bright and light – great choice of words! The room is just stunning, you have such a wonderful eye for decor! The entire room is absolutely gorgeous! 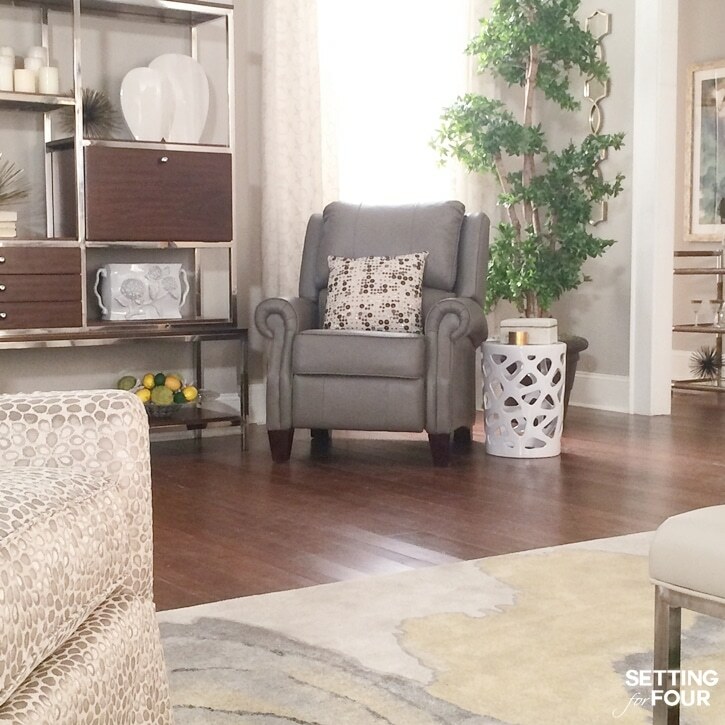 I love it all but that Talbot sofa is an excellent choice to anchor the room – swooning! I love the couch and the sunburst mirror. The room came out very nice! I love the mirror. I have a huge teak clock (that is similar in shape and size) and it’s one of my favourite pieces. All the best with they contest. Thanks Sarah!! Your teak clock sounds gorgeous!!! Oh My Word….. I like all the rooms. However….yours, STUNNING AND LIVABLE and I LOVE IT!!! You did an awesome job. WOW! You can come do my house any time you choose. Yes I voted for you and yes, I’ll do it again tomorrow Veryily Happily!! THANK YOU Hope!!! Thank you for voting for my room, thank you for loving my room and for leaving such gracious compliments – I so appreciate them!!! Wow, love your room. Even before I read this blog I picked yours as the best. So hard to choose, but I think I would pick the mirror. So bold! You room is so calming and serene without being boring or dull. I could move that room into my house right now with no regrets. Perfect! I love the whole room but especially the side chair with the metallic end table! That metallic end table has a hammered like finish and is such a pretty shape! Thank you for your lovely compliments Elaine! I have two favourites: the chrome and wood shelving unit and the table/ ottoman with the chrome and wood shelf. The openess of the shelving unit makes the room look bigger and the table/ottoman would serve many purposes in my family, LOL. We are actually looking for new sofas now and this gives me some inspiration! Good luck! I have always loved La-Z-Boy furniture and your couch is lovely!! Great to hear you’ve had fabulous experiences with La-Z-Boy furniture! The style and quality is amazing! 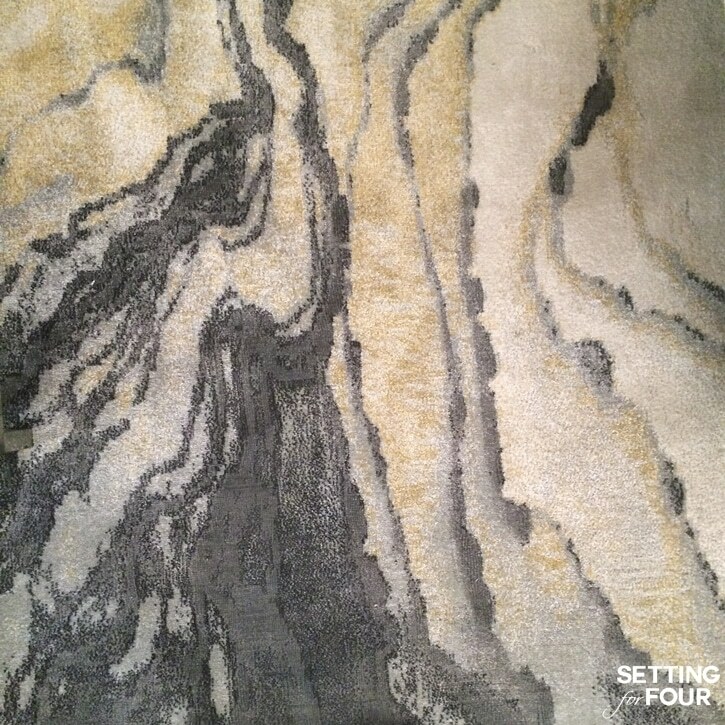 Thanks so much for visiting Setting for Four! I truly love the owl print! Isn’t it gorgeous Terie?? I’m a sucker for beautiful artwork like this owl print! 🙂 Thank you for visiting! My favorite pieces are the dove grey leather chairs, because these are what I most covet for my own home. Thank you! Thanks for visiting Meg and thank you for your beautiful compliments on the La-Z-Boy furniture and my room design! Definitely that couch, my sitting room is ALL LA-Z Boy and so worth every last penny! LOVE your design, well done! So glad to hear you love La-Z-Boy furniture too Elizabeth – thanks for your sweet compliments on my living room design! I hear you Kim – that area rug and the recliners are so AMAZING!!! I want them for myself too! 🙂 Thanks so much for your support and beautiful compliments and good luck with the contest!!! 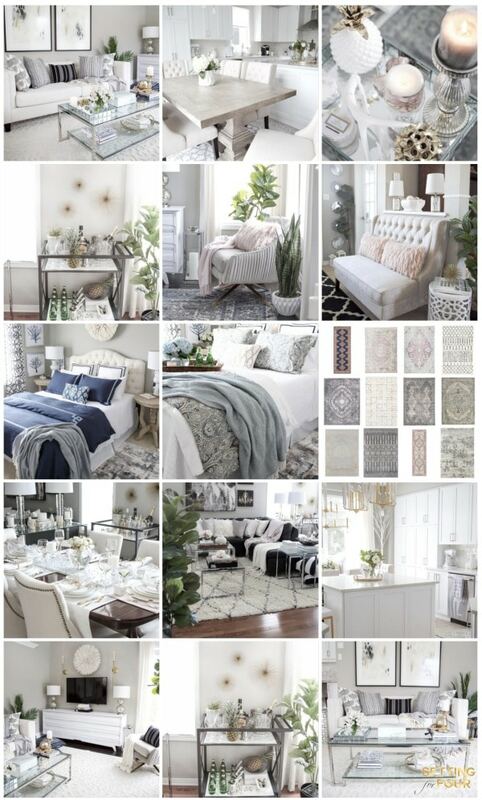 I think my favorite is the cream accent chair! I love the entire space though, you did an outstanding job! Oh that la-Z-Boy cream accent chair is stunning – it has a shimmery cream metallic fabric, a very cool organic geometric pattern and is a swivel rocker too – so comfortable and stylish!! Luv! Thanks for your compliments DeDe!! Heather, it is stunning! You did an amazing, amazing, amazing job! Thank you Jenna for your compliments!! It was so much fun to design this living room around such gorgeous La-Z-Boy furniture and decor! I voted! Yours is the best. Heather your room turned out amazing! I love every single piece of it so of course I voted! Great job! Aw – thank you so much Shanna for your vote! You can vote every day for a chance to win $10,000 in La-Z-Boy furniture!! What an amazing prize right?? Good luck with the contest and thank you for your lovely compliments on my room. I truly love every single piece in it too! I love the sofa you chose to start with. And brilliant idea to use the bowls on the wall. Thank you Lisa – the bowls are so interesting aren’t they? The Talbot sofa truly is gorgeous and comfy! Thanks for voting and good luck with the contest! I will definitely vote for your amazing room! I love every detail that you selected, but I think hanging those 3 metal bowls up high was genius! Thanks so much Jane – those bowls really gave the bookcase even more gorgeous impact – I’m in love with their organic shape and metallic finish. Yummy. Good luck with the contest Jane! I love absolutely everything! You’re so creative!! My favorite thing is the dove-grey leather chair!! A good sofa is really hard to find isn’t it Aeryn? 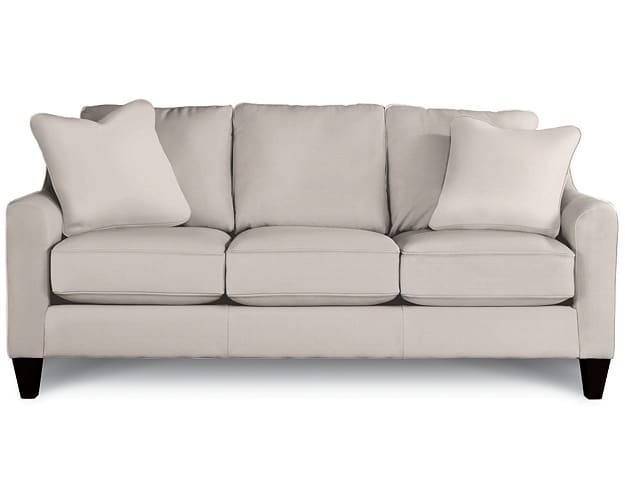 This Talbot sofa is incredibly comfy and with the performance fabric resists stains and spills too! I was blown away by all of the gorgeous options like the nail head trim and piping too! I love your room. The mirror, the sofa, chairs, all of it! Thank you Eileen – so glad you love everything in my room. So amazing that all of it is La-Z-Boy isn’t it?? Your room was my favorite!! It is so welcoming and comfortable. You are so sweet to say that Kelly!! Thank you sooooo much for your compliments! That’s exactly the look I was going for – comfortable and welcoming – so I’m glad you think my room has that feeling too! I absolutely love your sofa it’s timeless. It would work beautifully in the new living room design we are just starting. My fave thing in your room is definitely your sofa!! I am in love with it!! Me too Cheryl – so stylish and I love the nail head trim and leather piping!!! Just wanted to let you know that I voted for you and will keep doing so! Looked at all of them and love yours!! Oh thanks so much Cheryl for voting for my room – so appreciate that!! So glad you love my room – hugs! Your room looks beautiful. I’m swooning over the gray chair that its actually a recliner. Isn’t it amazing Paula?? It doesn’t look like a recliner at all but so comfy and stylish! You’d love it!! Thanks for your support and good luck with the contest! Voted for your room, it’s absolutely gorgeous! I would have to say my favorite piece is the geode! Thanks for voting for me Sarah!! The geode is so shimmery! I love the silver side table. I do too Kim – it’s a beautiful shape and love the shimmer!! Thanks for visiting! The room looks amazing and I love the sofa you picked. What a beautiful piece and all shelf and all the decor pieces are beautiful. My favorites are the sofa and the shelf full of candles. I love the sofa! The silver bowls used as wall art are a close second. The sofa and the rug are my favorites. How would you fancy just bringing that room in total ,here to me in the UK and style me glamorous?? ?The “Welcome” mat is waiting !! I’m on my way Lynn!! 😉 You are so gracious to leave such thoughtful compliments – thank you!! I’m thrilled you like my room and my style! Thanks so so much for visiting my blog! I love the chairs! I really like that there are two different types, the leather by the bookcase and the other smaller chair near the couch seating area. And I love that they all have the nail detail. Great eye BrieAnn!! 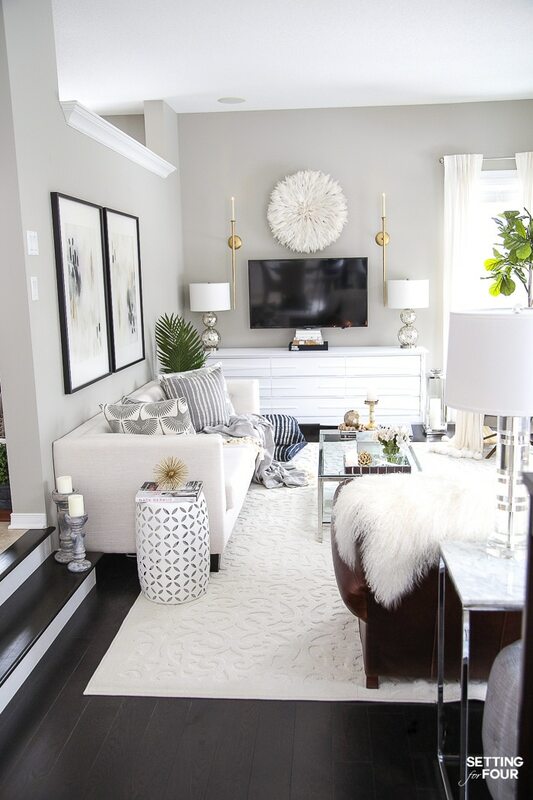 Yes they all have nailhead….those grey leather chairs are so stunning! Thanks for your compliments and for visiting! I love the area rug beautiful!!!!! It is all absolutely stunning! THANK YOU Ali – you are so sweet! Your compliments mean so much to me! I love the sofa AND the upholstered coffee table/bench. Can’t decide which I like best. Love the shelf with the variety of decor! And I love that it has the sections to hide some things! That shelving unit really is stunning Kari – I agree! I love the whole room,but the sofa in s my fav. It’s my fave too Barbara! Thanks for visiting and your lovely compliments! My favourite item is the over sized metallic gold mirror. It is such a statement piece. I actually have been voting for your room as I find it to be such a warm and inviting space. Love, Love, Love your room. BEAUTIFUL!!!! 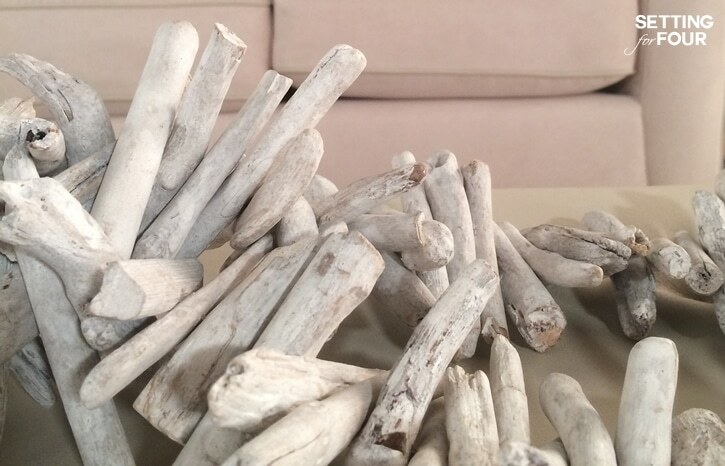 I love the couch and the chairs and the driftwood… beautiful room! THank you Jenn for visiting my blog and your sweet compliments! Your room is hands down the best! I love it from top to bottom – the colors, the metallics, the pieces are all perfect. I love the sofa!! Looks like a fun event you took part in, thanks for sharing the results with us! I also voted for you. Your room was hands down my favorite & it’s exactly my style. Great job!!! LOL – thanks for your lovely compliments Janelle and for voting for my room!! I’m soooo glad you like it! 🙂 Good luck with the contest! Fingers crossed for you — I’ve been voting every day! Oh thanks soooo much Janelle for voting for my room every day!!! Hugs!!! Your compliments just made my day 🙂 Have a wonderful day! Hugs Janelle – you are so sweet to say that and I ca’t tell you how much it means to me that you voted for my room!! THANK YOU!! What an amazing room! I love the silver and cream tones, gorgeous! Hi Sharon! Your lovely comments just made my day!! Thanks so much for voting for my room – I really appreciate that and am glad you like it! Have a wonderful day! Can you come to my house in Palm Springs and help me 🙂 I love this room. Where can I purchase the rug it will tie my whole idea together? 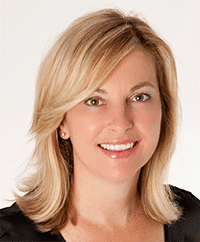 Suer Lori – I’d love to help you!! 🙂 That area rug isn’t available right now but I found two similar styles and patterns! They are http://rstyle.me/~7H1PK and http://rstyle.me/~7H1QD! Thank you for your compliments on my room! Wow! Looks comfy, cozy and beautiful! Honestly I didn’t know Lazboy had pretty stuff like this. I thought it was just clunky recliners. Thank you Lisa for your lovely compliments on my room!! Heather, this is gorgeous! Where did u find the hammered table? Thanks Heather for the compliments on my living room! The hammered table and everything in this room is from La-Z-Boy furniture! I love the hammered texture too. Please tell me where you got that rug!!!! It’s so beautiful and exactly what I’m looking for in my living room. Hi Sabrina! It’s gorgeous isn’t it?? I don’t think it’s available anymore but I found two similar beautiful styles and colors! Here they are: http://rstyle.me/~7H1QD and http://rstyle.me/~7H1PK! Have fun decorating your living room! I love the shelving unit!! Can you tell me where is it from?? My BF and I want to buy the same one! Hi Isabelle! I love it too! You can get it here http://rstyle.me/n/bjvpjw27qn (affilate link). It’s stunning and I love that it has storage with both drawers and shelves! As much as I love everything about your room, I especially LOVE the coffee table! Upholstered top, shelf underneath. It’s EXACTLY what I’ve been looking for! Can you please tell me where I can get the same one??? Please tell me what BRAND is the area rug? The Brand is Feizy Lana – hope this helps! Holy bologna that couch is GORGEOUS!! Elegantly drooling. All your tips are fabulous also, thanks! 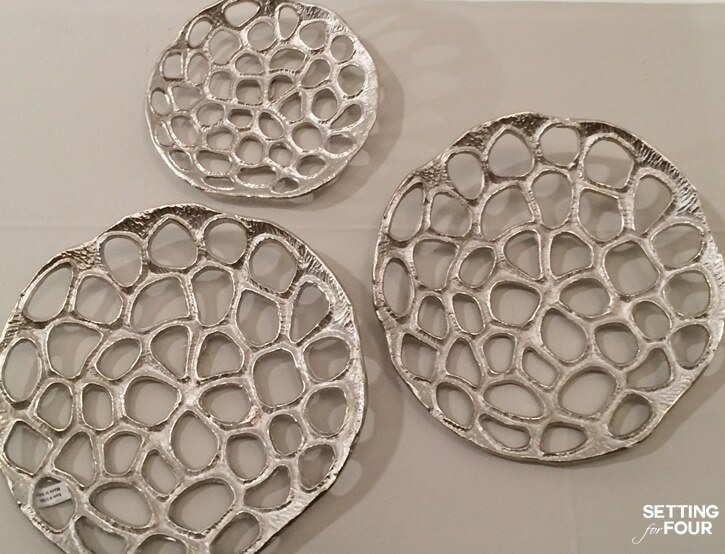 Love this design- link for the silver plates? above the shelving seems to be broken. Just curious where they came from? Thanks! Hi Virginia – thanks for letting me know the link wasn’t working – I updated it! Have a beautiful week! Thanks so much Trish! I’m really nervous on video to be honest and really hate cameras too lol! I always have been that way!! I will be making more videos for upcoming blog posts since I think they can be extra helpful when showing a project or a decorating idea. Thank you for your supportive comments – I’m SO GLAD to hear you feel like I come across as a friend – that’s exactly what I was hoping for! Have a super week!